Description: This is usually a multistemmed shrub (less often a small tree) about 3-20' tall. 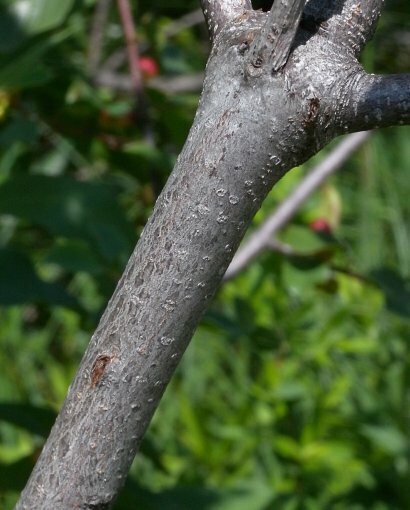 The bark of older branches or trunks is gray and slightly wrinkled or rough-textured. Young branches and twigs are brown with abundant white lenticels (air pores), while young shoots are light green, pale yellowish brown, or red, terete (circular in cross-section), and glabrous to slightly short-pubescent. Deciduous alternate leaves occur along the young shoots and twigs. These leaves are 1–3" long and ½–1½" across; they are elliptic-oblong to ovate-oblong in shape, while their margins are entire (toothless) and sometimes undulate (wavy up-and-down). The leaves have narrowly rounded bases, while their tips are acute. The upper leaf surface is medium to dark green, hairless, and shiny, while the lower leaf surface is medium green and hairless to slightly short-pubescent. Leaf venation is pinnate. Each leaf has about 6-8 pairs of lateral veins that are parallel to each other; they curve toward the leaf tips as they approach the leaf margins. The petioles are light green to red and up to ½" long. Either solitary or small umbels of 2-6 flowers (usually the latter) develop from the axils of the leaves; the solitary flowers and umbels of flowers are sessile. Each flower is a little less than ¼" across, consisting of 5 yellowish green to white sepals, 5 white petals, 5 stamens, and a pistil. The sepals have a petaloid appearance and they are joined together at the base; their tips are triangular in shape. The petals are shorter than the sepals and individually divided into 2 rounded lobes. The slender pedicels of the flowers are up to 8 mm. (1/3" long) and hairless. The blooming period occurs from early summer to late summer, lasting about 3 months. Both blooming flowers and drupes at different stages of develop can occur on this woody plant at the same time. Cross-pollination of the flowers is necessary in order to produce fruit. The drupes are about ¼" (6 mm.) across, globoid in shape, and hairless. As they develop, the drupes change color from green, to yellow, to red, and finally to black at maturity. The drupes are either solitary or they occur in umbels of 2-3 (some flowers don't develop into drupes). The interior of mature drupes is fleshy or juicy, containing 1-3 hardened seeds (stones). The woody root system is reddish, shallow, and spreading. New clonal shoots can develop from the roots. Cultivation: This shrub prefers full to partial sun and wet to moist conditions. It can adapt to different kinds of soil, including those that are silty, sandy, loamy, and peaty. Soil pH can be acidic to slightly alkaline. This shrub is very winter-hardy. It is potentially invasive (especially near the Great Lakes) and its cultivation should be avoided. Range & Habitat: The non-native Glossy Buckthorn is locally common to occasional in northern Illinois, uncommon or rare in central Illinois, and largely absent from the southern section of the state (see Distribution Map). 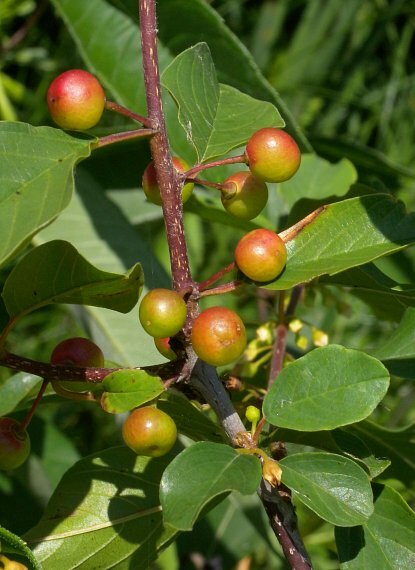 Glossy Buckthorn was introduced into North America as an ornamental shrub, and to improve habitat for wildlife. It is native to Europe, central Asia, and northern Africa. Habitats include forested bogs, shrub bogs, fens, willow thickets, sedge meadows, moist sandy savannas, riverbanks and borders of ponds, swamps, powerline clearances in moist sandy areas, roadside ditches, and waste areas. In other states, this shrub has been found in alder thickets and open woodlands that are dominated by White Pine (Pinus strobus). Glossy Buckthorn is considered an invasive shrub in many areas of NE USA, Midwestern USA, and SE Canada. It competes directly with such native shrubs as Highbush Blueberry (Vaccinium corymbosum) and Dwarf Birch (Betula pumila); see Taft & Solecki (1990). Faunal Associations: The small flowers are visited by bees, wasps, flies, and beetles. Both nectar and pollen are available as floral rewards. Information about what kind of insects feed on Glossy Buckthorn in North America is rather limited. The leaves are eaten by the caterpillars of an oligolectic moth, Metrea ostreonalis (Oystershell Metrea). There are also records of the caterpillars of two polyphagous moths, Triphosa haesitata (Tissue Moth) and Hyalophora cecropia (Cecropia Moth), feeding on the leaves of buckthorns (Frangula spp., Rhamnus spp. ); see Natural History Museum (2015) and Wagner (2005). The caterpillars of a butterfly, Callophrys henrici (Henry's Elfin), feed on the leaves of Glossy Buckthorn in Ontario, Canada (Catling et al., 1998). Some vertebrate animals also use Glossy Buckthorn as a source of food. The fruit is eaten by such songbirds as the American Robin, Cedar Waxwing, Bohemian Waxwing, Rose-breasted Grosbeak, and European Starling (Gucker, 2008). DeGraaf (2002) lists additional birds that feed on the fruits of buckthorns. Among mammals, the seeds are carried to caches by small rodents, where they are stored and eaten; large mammalian herbivores (probably deer) browse on the twigs and foliage (Knapp et al., 2008). Many of these vertebrate animals spread the seeds to new locations. Photographic Location: A sandy willow thicket at Illinois Beach State Park in NE Illinois. Comments: While its flowers are not very showy, Glossy Buckthorn has attractive foliage and fruits. This non-native shrub is unusual in having blooming flowers and maturing fruits on its branches at the same time. Other buckthorns (Rhamnus spp., Frangula spp.) in Illinois, including the non-native Common Buckthorn (Rhamnus cathartica), produce blooming flowers first and maturing fruits afterwards. Compared to Glossy Buckthorn, Common Buckthorn differs by having toothed leaves and its leaves have fewer lateral veins (typically 2-3 pairs). 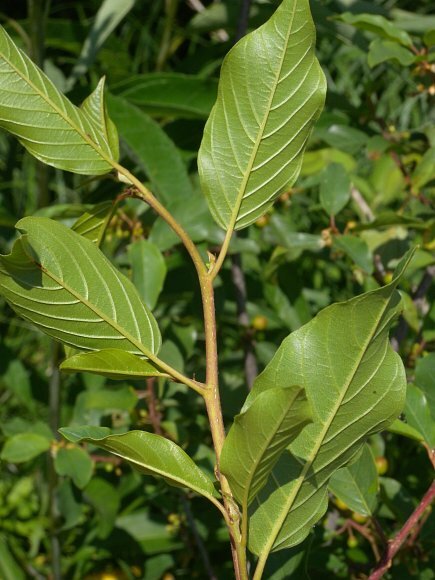 The native Lance-leaved Buckthorn (Rhamnus lanceolata) is a smaller shrub (up to 6' tall) that also has toothed leaves and the tips of its leaves tend to be more tapered and acute. 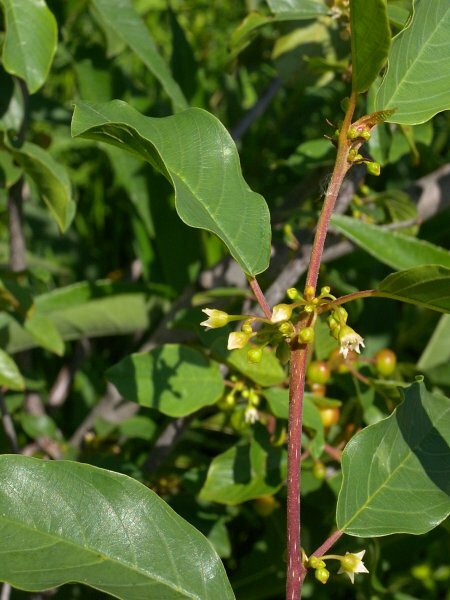 Another native species, Bog Buckthorn (Rhamnus alnifolia), is a dwarf shrub up to 3' tall that has toothed leaves. All of these Rhamnus spp., with the exception of Bog Buckthorn, differ from Glossy Buckthorn by having flowers with only 4 sepals and 4 petals. The most similar species, Carolina Buckthorn (Frangula caroliniana), has been found only in southern Illinois. Unlike Glossy Buckthorn, Carolina Buckthorn has pubescent pedicels and its leaves tend to be slightly longer (sometimes up to 5" in length). In addition, the umbels of flowers of Carolina Buckthorn are sometimes non-sessile; they can occur on peduncles or short lateral shoots up to ¼" (6 mm.) in length. A scientific synonym of Glossy Buckthorn is Rhamnus frangula.